UCC Library, as part of the Sir Henrys @UCC Library exhibition, recently hosted a roundtable discussion titled Pop@UCC: On the Value of Popular Music Archives. The speakers were from within and without the academy and provided some interesting insights on the area of archives and popular music. The speakers on the panel were Stevie Grainger, Cronan O Doibhlin, Ray Scannell, Jez Collins and Siobhan O Mahony. The panel was chaired by Eileen Hogan. Some perceptive and interesting insights were provided from the floor by, amongst others, Andy Linehan, Aaron Casey, Griffith Rollefson, Luke O Brien & John Byrne. What follows below is a quick summary of ideas discussed in the session. As Social media is such an integral part of many people's lives we are now intuitively more aware of archiving, what it is and how to do it. We now actually document our daily lives. When we post a picture of ourselves on Facebook or Instagram we are archiving our lives. When we post a comment on Twitter we are archiving our thoughts. When we blog we are archiving our thoughts and ideas. With Social Media, and how we use it, we are all well on our way to becoming DIY archivists. Popular Cultural archives within the Institutional setting are slowly beginning to appear. But it is still the case that American universities are far more open in their approach to popular cultural archives than their European counterparts. Exhibitions should provoke. They should shake us, make us think about, and see, things in a different light. A good exhibition will always do this. Social Media sites are a wonderful resource for research or archival data. Sites like Facebook, Twitter, Instagram etc are a boon to those seeking material. BUT there are too many hidden resources on these sites - it is not always the easiest to mine these rich resources. Seeing how difficult it is to find material on these sites shows the key role that metadata has in increasing access to resources. Facebook is a necessary evil. There is so much material being posted there - but it all gets lost so quickly and is then extremely difficult to retrieve. If you have a personal archive you need to ensure that it lives on. That archive can end up being your legacy. Libraries and museums need to engage with the DIY or hobbyist archivists. Often, these archives are created through passion - what happens the archive when the person is no longer around to maintain it? Often it dies out with the person who created it and upkeeps it. Magazines and newspapers are always looking for live gig photos. There are so many amateur pictures out there that could be licensed. Siobhan O Mahony, for example, has had her photos of Kurt Cobain and Dave Grohl published in The Irish Times. Posting these images on Facebook throws them out into the public domain. For the library, Popular Music Archives are a great way of engaging with the community. The Sir Henrys @ UCC Library Exhibition has been a great success in drawing people, many of whom have never even been on UCC grounds before, into the library. The footfall has been tremendous. There are issues with crowdsourcing material. For example, people can be very precious with their material. They have an emotional attachment to it. The question for the institutional archivist is - How to get the people to let go of their material? How does the Institutional Archive encourage people to donate their material? How do we get them to break this emotional tie they have with the material? The process of curating an exhibition is like the process of writing a play - you are creating a narrative, you are telling a story. DIY Archivists with good material must be informed that donations are not stuffed in a drawer. Great care is taken with the material. Material is archived properly to save it for generations. The DIY Archivist must be shown how their material will be taken care of. They need to be walked through the institutions archives to show how the material will be cared for. They need have explained to them how the material will be catalogued, and stored and preserved and how access to it will be provided. Sustainability and access are two major issues with regards to archiving popular music material. Discussion with potential donors can be a long drawn out process. It can literally take years. Relationships need to be built between the donor and the institution. The pictures that people take at gigs or clubs, for example the work that Luke O Brien has done in recording the Dance / Sweat scene in Henrys are cultural history or phenomenon. They are capturing a phenomenon for posterity. We do exhibitions to engage with community, to showcase our collections or to stimulate and provoke discussion. The Sir Henrys exhibition was an opportunity to create something new. It was an opportunity to create something beyond the older printed books. For those who wish to read more, and / or listen to the full event, Jez Collins has posted a report, with full audio, of the discussion here. On the 14th and 15th August 2014 I attended the IFLA Satellite Meeting on Information Literacy in Limerick. The meeting gave me the chance to get a little deeper into the elements involved in delivery and assessment of Information Literacy, and to examine alternative approaches to and definitions of it. This was my first international conference, and as is to be expected, the conversations had outside of the meeting rooms over coffee or meals were just as interesting and useful for learning about new events, teaching tools, and projects that others are working on. I have to give a mention of thanks here to groups such as NPD Ireland and the sections of the Library Association whose events I have attended over the last two years and have offered the opportunity to dip a toe in the networking pool through “speed-networking” etc. This certainly made the prospect of striking up conversations with my fellow attendees slightly less daunting. The below summaries are just a selection of the many and varied presentations I attended over the two days, and the key points I took from them. Using examples from her own research at the University of Rochester and subsequent studies, Foster presented findings from investigating different information seeking groups and how their approaches and techniques for searching differ. She elaborated on the different techniques observed in a good average student getting high grades vs. a time pressured researcher with a funding deadline, or a busy medical student. She noted that bad habits don't necessarily equal low information literacy – the people studied were found to be good researchers. Researchers are “messily organised” - only they need to find the information in their office so they cannot be judged on this, they must be assessed on their output. Foster also stated that we cannot judge our best researchers by their use of Boolean operators! Forthcoming research will provide new knowledge of the nitty-gritty of research for librarians through an ethnographic study of students’ processes. This is drawn from students keeping map diaries, providing details of what students are doing throughout the day: where they go daily, and what areas are seldom visited. The study also utilised photo elicitation interviews, retrospective interviews where participants drew comic strips, and a Design Workshop on their ideal website. The results are not fully analysed yet but Foster advised looking out for their publication as it will provide valuable insights into how students and researchers search and manage their information, and help us to make this more efficient, but in ways that suit their habits. Glover shared her experience of a library research course, run completely online. The course runs for 8 weeks and covers a research problem given by the instructor at the beginning of the course, the final project being an annotated bibliography. • Modelling – an example from a previous student who did well is shared with the students. • Rubric - students know how they will be evaluated and it is also used for conducting peer evaluation. Beware of a mechanics only rubric - sometimes students got mechanics right but didn’t achieve the overall quality required. • Scaffolding - detailed feedback is given at the beginning, this then tapers to only being essential support. • Journaling - students record how they are going to take what they learnt and use it in other courses. This has proved to be the most successful part of class affording a place for reflections and communication with the tutor. • Peer Review – the class had previously lacked peer interaction and a colleague recommended peer review. Students learn from each other by correcting each other’s work and gain a sense of responsibility for each other. Glover noted that she has not witnessed negative feedback in the peer review, sometimes the students don't give a lot, but generally it's constructive. The annotated bibliography is worth the majority of marks. Continuous feedback and providing the rubric results in very high pass rates and the retention rates have been excellent each time the course is run. The student evaluation of the course have been very positive, in particular they appreciate that it is well organised and sets clear expectations. This online library course was born out of students’ repeatedly requesting help with literature searches. The course runs over 5 days and participants post reflections, learning and questions online about the course content. The feedback has been consistently good every time the course has run. However, those online in the evening weren't getting as much support as those who were logging-on during the day. This was down to tutors being online during their working day, typically finishing at about 5pm in the UK. Newall looked at how to negotiate this problem, and decided to follow the sun! She sought new tutors for the course from Washington and China, creating an international partnership with Qiu and Roemer. Tutors assisted all students participating in the course regardless of location. There were set exercises and set resources in the course which made things straightforward for the international tutors. The US students enjoyed participating in a course based in the UK, and it gave the students in the University of Nottingham’s Chinese campus a greater sense of belonging to their parent University. This solution of cross-time-zone tutoring allowed better responses to student queries, although sometimes it wasn’t clear what time they should log-in. In future they will clarify this across the time-zones. Differences in academic terminology are also an important factor to note when tutors are corresponding with students in a different region. Overall, this partnership allowed for a great exchange of ideas, peer learning across countries and a professional development opportunity for all of those involved. From a selection of workshops, I chose to attend Brandy Whitlock and Julie Nanavati's 'Coming Face-to-Face with the Future of IL Assessment: Why and How to Use Authentic and Performative Measures to Assess Student Learning'. Whitlock and Nanavati highlighted ways to set clear learning objectives, how to match those with appropriate assessments, and how the results of assessment can be used to modify future classes. They advised using ACRL standards and Bloom’s Taxonomy to help devise manageable outcomes. The student should always be at the centre of the outcome, focusing on what they will be able to do after instruction. Whitlock and Nanavati emphasised the need to continually update your class based on students’ success and feedback, and shared examples of how they have done this in their courses. Michelle Dalton presented on UCD’s experience of using LibGuides to help direct students to relevant resources for their subject. Dalton warned against using LibGuides to market your library’s content. They should be used as a filter, helping students to navigate information within their discipline. At UCD they determined to keep the guides simple, not wanting to overload students with information. 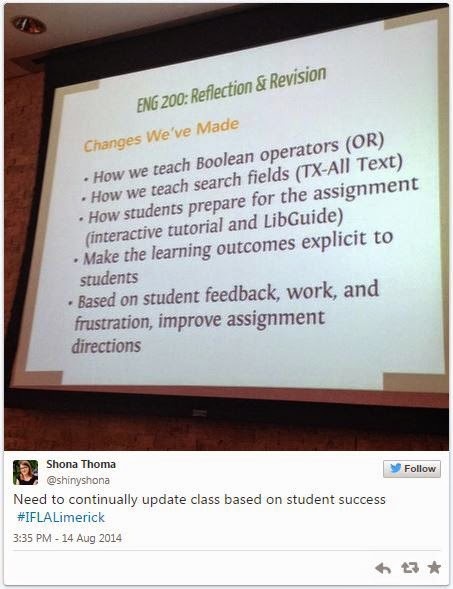 Students don't think they need LibGuides or they don't know about them. Marketing the guides is key to their success, and improving the students’ research experience. Those students who used the guides found them really useful. A statistics package is built into LibGuides so analysis could be done on a detailed guide vs. minimal guide. Students looked at the introduction page and databases guide mainly. They don’t spend a huge amount of time on the LibGuide pages. Link usage can also be analysed. This data could then be used to check with academic staff if the resources being used are in fact the ones they want students to use. LibGuides are now used for all e-learning support at UCD. Promotion was carried out through face to face instruction and collaboration with academic staff. More information on UCD Library’s LibGuides experience can be found in the Journal of Academic Librarianship. Faced with a new generation of students and a trend towards lack of motivation in higher education, Knautz, Wintermeyer and Goretz asked: how can we improve higher education and make a more dynamic learning environment? They found the answer in “gamification”. They decided to use game elements for conducting information literacy instruction. Rewards throughout a computer-game styled learning platform were used to drive student motivation. Students need to compete against each other and their tutors by completing tasks that would advance their information literacy. Students usually receive experience points for completing quests, helping them to move through the levels of the game. The students also choose an avatar from four possible races, for example elf or giant, adding to the game-like experience. There are 15 possible levels, with the information literacy course being passed at Level 11. If students continue playing beyond Level 11 they get a better than pass grade. There are also extra achievement badges to collect. The use of a leader board contributes to the game-like environment and helps to motivate students by creating competition. They cannot see whole leader board however – just their immediate neighbours. The students and tutors gave very positive feedback on the game being a useful tool for exam preparation. The ability to achieve bonus points towards the final exam was seen as very useful to the students! The benefits of engaging students with these game elements have obviously been recognised as the creators have been asked to develop a meta-system to allow lecturers to “gamify” their courses. Stephens spoke about how he hopes his 8 year old neighbour won't be told to turn his device off in his future education. The phone shouldn’t be seen as a barrier but a new opportunity to engage with education. For librarians, this means adapting our skills so that we can be useful in new ways. This could mean helping educators to build learning platforms, conducting outreach with mobile technology or expanding the audience for our collections in unexpected ways. Experimenting with apps, software and other new technology is the best way to learn how they will be useful to us. Stephens asked us to challenge our concept of professional development, moving away from PowerPoint and reading journals. He noted that while people might be uncomfortable with changes and chaos, we need this for innovation to occur. For the library to be a place where learning happens, their needs to be room for play and discovery suited to multiple intelligences. 3. Embracing new opportunities provided by emerging technologies – exploring new tools as part of CPD. 4. Gamification – creating new ways to engage students is becoming increasingly important and this looks set to be big. 5. Information Literacy skills beyond formal education – using in information literacy in new contexts and being flexible in our definitions. I created a Storify of tweets from the meeting. Dr Sheila Webber has more blogs and information from presentations I didn’t make it to on her site. Check out the following upcoming webinars. Topics covered include audience research methods to inform website redesign efforts, library self-service software (not limited to self-issuing technology), a talk on 25+ free tech tools in support of patron engagement and digital literacy skills development and, finally, a discussion around the issue of library censorship (banned books). It's critical to make informed decisions about content, navigation, and design when creating or redesigning your website. Through a user-centred design approach, you can better understand who your visitors are, how they perceive your organization, and how they interact with your website. What do site visitors need? What are the key messages that drive them to take action? What are their abilities and limitations? These questions are best answered by going directly to the source: Your audience. This webinar will explain how a small investment in audience research can provide the insight you need to improve your visitors’ experience. How can you get to know your audience? Self-service library technology is everywhere nowadays, from machines that can scan and sort books automatically to self-checkout stations and book vending machines, allowing patrons to access library materials and services without a personal interaction. • How can self-service devices and technology most effectively work for you and your library? • How does this technology change the nature of how you interact with your patrons? • If you’ve got a limited budget, which type of machines should you look at to meet your needs? Join this webinar to explore a toolbox of 25+ free tech tools that you can use to help your library better serve patron needs and to work smarter. With so many new tech tools popping up everywhere, we are all working on a wild frontier of possibilities. But how do you know which tools are worth “taming” to help you provide better library services? In this webinar, tech-tamer Kieran Hixon will unpack a toolbox of 25+ free tech tools that can help your library better engage with patrons and build digital literacy skills. From completing daily tasks to growing advocacy efforts, these web based tools can help you work smarter. In 2013, there were 307 reported requests for books to be removed from America’s libraries, potentially putting those volumes out of reach of students, readers, and learners of all types. While every corner of the map faces unique issues related to library censorship, these issues also catalyze passionate freedom-to-read advocates dedicated to getting these books back on library shelves. In this one-hour webinar, we will “travel” from London, to South Carolina, to Texas, to California, to talk with three activists about the problems they face and their efforts to un-ban books. • London, UK: Jodie Ginsberg, CEO of Index on Censorship, will start us off by discussing issues faced outside of the U.S. and how Index chooses to respond. • Charleston, South Carolina: We will then travel to Charleston -- where the graphic novel Fun Home: A Family Tragicomic by Alison Bechdel has been a flashpoint in a university funding controversy -- to hear from Shelia Harrell-Roye, a committee member from Charleston Friends of the Library. With the 2014 Banned Books Week focus on graphic novels, Harrell-Roye will discuss what her group has been doing to support this critically acclaimed book. • Houston, Texas: From Charleston, we will move to Houston to hear from Tony Diaz, author, radio host, and leader of El Librotraficante. Diaz is a champion for banned books and for ethnic studies textbooks in both Arizona and Texas. This banned books journey will end in Thousand Oaks, California, where a representative from SAGE (the webinar sponsor) will take your questions for these three defenders of the freedom to read. Guest post by Sarah Kennedy. It’s that time again when students are getting themselves ready to start or go back to college and that has me thinking about my ‘back to school’ experience entering the Masters in Library and Information Studies in UCD back in 2012 and how valuable the experience was for me. I have to be honest and say I never expected to walk out of college and straight into a paid library job. Be that as it may, I didn’t realise just how difficult it would be trying to get a job in the library world. However, having said that, I don’t at all regret my decision to go back to college and study for my MLIS in UCD. I knew it wouldn’t be a walk in the park when I made my decision and I am of the belief that a bit of hard work to get where you want to be in life isn’t necessarily a bad thing. It makes you even more focused and determined. Following the MLIS I had a fantastic experience on a JobBridge scheme but of course we can’t survive on JobBridge schemes and unpaid work experience forever. They are fantastic for gaining necessary experience but staying on these schemes long-term isn’t sustainable for a lot of us (and nor should it be). I think in the current climate it is important to also ‘think outside the box’ (in this case librarianship) and maybe examine non-traditional roles where people with the skills gained through the MLIS can excel. For example, I currently work in the Research Department of my organisation, a role I wouldn’t have gotten were it not for my experience in the MLIS, both in terms of the research modules I was required to complete and the research I was involved with for my Capstone project. Currently, I’m involved in literature search and review, data management and data analysis, all of which I gained the skills to do during my MLIS year. And research isn’t the only non-traditional role in which MLIS graduates could find themselves. The MLIS offers a good range of diverse modules that could lead you in various directions, for example information architecture, web publishing and social computing modules were all on offer when I was doing my degree. And now, this year’s intake are offered Mobile Application Development and a module on E-health. Of course, like me, many will have done the course (or are thinking about doing the course) with the expressed desire of becoming a librarian but I believe that the really important thing is that upon graduation we are out there using our skills and showing people what information professionals can do. At the same time I also think that should the climate change and library jobs become more available then being qualified and having experience in diverse areas should only help your application rather than hinder it. You will be able to offer qualifications and something different to your employer. In truth many library jobs are now becoming so varied that they are merely a shadow of their ‘traditional’ selves with librarians taking on tasks like social media marketing, research, troubleshooting IT issues and web design and management, so every extra skill you can bring could be hugely valuable. I would hope that a potential employer would see that I am able to understand different research methods, have experience with funding applications, have undertaken data analysis etc. and that this would make me an asset in a library environment where I would be able to understand the needs of the library users involved in research activities or even assist with conducting research on the library service itself. Plus, because of the MLIS and my work experience I still have all the traditional skills that are important like cataloguing, teaching and designing information literacy courses, understanding issues in digital librarianship, dealing with reference questions etc. And these also translate to non-traditional jobs if that is where you choose to stay. For example, cataloguing modules make you understand the importance of organisation of information, labelling and making folders and files easier to navigate and find. This is an asset in any organisation. One other very important part of the MLIS that I really have to mention is the fact that it is where I started building a network of information professionals. Without developing connections with my peers and being able to discuss various modules and group assignments with them I would never have had the confidence to branch out and seek to expand my network. (A network, which over the past 18 months, has been hugely important and beneficial to me.) Information professionals are among the most generous people I have ever witnessed when it comes to lending advice, sharing knowledge and ideas. I really commend SILS for inviting guest speakers, hosting the careers breakfast and promoting groups like NPDIreland, thus encouraging their students to reach out and get involved even before we’ve left the course. I also enjoyed that the management module involved going out to organisations and meeting experienced professionals thus benefiting from their knowledge. I would even encourage more of this, perhaps with library visits to view different library management systems etc. I believe and I think that many would agree that being an information professional, be it as a librarian or in a more non-traditional role, means lifelong learning and continuous professional development are essential aspects of the job. It is important that we continually seek out new opportunities and knowledge as new technology changes our field. I would have to say that the MLIS in UCD was a great base for me and that while the lecturers taught me a great deal, they also encourage their students to investigate and build on what they are discussing in class through great constructivist approaches and assessments. This approach is extremely beneficial for life outside of college and encourages CPD. For those going back to do the MLIS that already have library experience or have done the GradDip I think the addition of the new, more technical modules is very welcome and makes returning all the more worthwhile. For all these reasons I would say the MLIS has a great deal of value. It has been extremely valuable to me and will, I am sure, continue be valuable to me in the future. I wish the very best of luck to the class of 2015. 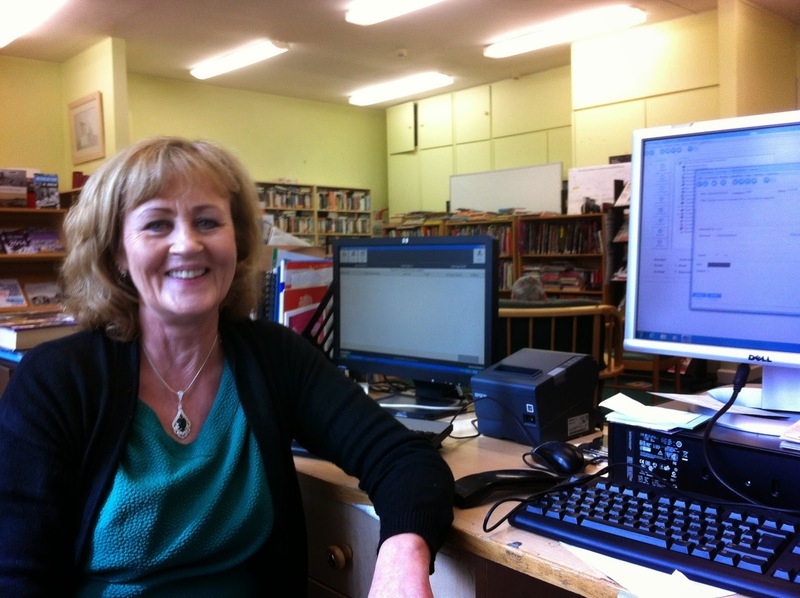 Guest post by Bernadette Mellon, Library Assistant, Maynooth University. Each year the Library Association of Ireland (LAI) organises a week of events to promote libraries throughout Ireland. One of the events that takes place during ‘Library Ireland Week’ is the ‘Library Exchange Scheme.’ This allows staff from different libraries exchange for a day to experience ‘a day in the life’ so to speak. I had read interesting accounts of various exchanges undertaken by my colleagues and I decided it was time to experience it for myself. Our Deputy Librarian, who is responsible for staff development, suggested that the John J. Jennings Library at Stewarts Care Ltd., in Palmerstown, Dublin, might be able to facilitate the exchange. I contacted the Librarian, Siobhan McCrystal and she was kind enough to agree to host my visit. The John J Jennings Library, named after a former Chairman of the hospital, is situated on the Stewarts Care Campus at Palmerstown in Dublin. Stewarts Hospital is a charitable foundation and provides care for people with intellectual disability. It also offers support for people with severe disabilities regardless of age, religion and socio economic background. The Library at Stewarts Hospital was officially opened in 2000 and is the result of a partnership between the HSE, Stewarts Care Ltd., and South Dublin County Council to address the information needs in Stewarts and to provide a public library service to the wider community in Palmerstown. Siobhan McCrystal’s article “Value Added: Case Study of a Joint-use Library,” An Leabharlann, Vol. 21(1), March 2012 gives a very good insight into the various roles and user groups. The Library at Maynooth University caters for upwards of 8,000 students from all walks of life and in 2013 opened a new state of the art library which will facilitate the needs of our students into the future and greatly enhance their university experience. While Library Ireland Week is in November each year, Maynooth University has scheduled exchanges outside this period, because it is a particularly busy time close to start of term. April 3rd was agreed as the day I would go on my exchange. Also, because of staffing constraints in Siobhan’s library, it was agreed that rather than a return visit to the Library, Siobhan would be invited to attend some events in the Maynooth University Library to suit her schedule. I set off with a slight trepidation. What would my experience be like? I was greeted warmly by Siobhan and immediately noticed the colours around the library. I realised that the books still had their covers on and this was adding colour to the room. It was such a small thing but very obvious. Book covers are removed in our library so the colours tend to be more uniform, black, grey and green. Siobhan took me through what would be the normal morning procedures, logging on to their library management system ‘Open Galaxy’ which is used by all South Dublin County Council libraries. Checking emails, answering phone calls and dealing face to face queries from service users and staff, were all part of the routine. The post was delivered that morning by a very happy and chatty service user accompanied by his guide dog. Siobhan explained that patrons registered with Stewarts Library can request books from any South Dublin County Council Library. Books are transported in boxes to and from the relevant library depending on the request. The library collection consists of up to date best sellers, which are shelved alphabetically under author, while medical and course books for students are catalogued using the Dewey Decimal System and shelved accordingly. The library also has a dedicated section for children with up to date books, a multisensory collection, DVDs and talking books. Daily newspapers and magazines are available. Brochures and information pamphlets are also available. Library holdings can be accessed by searching http://library.sdublincoco.ie. Internet access is free to all patrons. Assistive technology is available if needed. Printing and photocopying facilities are available for a nominal fee. Stewarts subscribe to 30 medical journal titles but have access to hundreds of other journal titles through their membership of the Irish Health Care Libraries Group (a co-operative of Irish healthcare libraries sharing journals). Databases and journals are available on the IDAAL website. Needless to say the morning flew by and Siobhan very kindly treated me to lunch in the staff canteen which provided an array of delicious hot and cold meals, sandwiches, wraps, tea and coffee. We had a chat over lunch about the events of the morning which included a visit from local school children who were celebrating ECO Week by listening and singing along to songs about the environment ‘as gaeilge’. It was fortunate that Mary, the library assistant was off that day as it would have been a tight squeeze behind the desk. With group visits etc., there is very little space. After lunch it was just as hectic with people dropping in to use the internet, choose a book, or just relax and read the paper. The ECO event was repeated in the afternoon for some of the service users who sang along with gusto. As with the morning the afternoon went by very quickly and it was with reluctance that I took my leave of Siobhan and her wonderful library. That evening the library was hosting a music appreciation class for the local community and a monthly book club meeting was scheduled to take place the following week. The book club, with members from the local Palmerstown area, meets monthly. We were really pleased when the club picked “Silence Would be Treason: Last Writings of Ken Saro-Wiwa” for their February read. The book is based on letters held in Maynooth University Library. I thought prior to my exchange that as the library building was small in comparison to the library at Maynooth University I might find the day going by very slowly with little happening. How wrong I was! The John J Jennings Library is a hub serving the wider Palmerstown community as well as staff and service users at Stewarts Hospital. It is a library first and foremost but it is also a place where people can relax and feel welcome, whether it be on their own, with a group or just taking time out to chat or sit and reflect. A wonderful atmosphere of belonging prevails in this library, one that I reluctantly left. I learned so much about a library service that is quite different to my experiences in Maynooth University: it was certainly a very enriching experience. I would like to thank Siobhan for her patience and time in making this a special day to remember. I would definitely recommend a library exchange visit. Go for it, you never know what you will discover.